Spasticity is a consequence of injury to the brain or spinal cord, that can lead to life-threatening, disabling. Sensory impulses are generated as a result of stretching of muscle spindles. The afferent volley ascends to the spinal cord. It excites discharge of the alpha motor neurons of the same muscle. It inhibits the motor neuron pools of antagonistic muscles through a disynaptic pathway. It facilitates, probably monosynaptically, the motor neurons of synergistic pools. When a muscle is stretched, the Ia afferent neuron transmits excitatory messages from its receptor, the muscle spindle, to the alpha motor neuron of the same muscle by means of a monosynaptic connection Ia discharge is normally reduced by presynaptic inhibition and the reduced levels of presynaptic inhibition can lead to an increased stretch reflex. The alpha motor neuron can also be affected by the Ia excitatory polysynaptic pathway. Facilitation of this pathway leads to increased stretch reflexes. When a muscle is stretched, the reflex evoked in that muscle is normally accompanied by inhibition of the opposing muscle. Lack of reciprocal inhibition can lead to unwanted activation of the antagonist muscle and impede movement. The Ia inhibitory interneuron receives excitatory synaptic input from many descending pathways that includes the corticospinal tract. Input from the descending tracts is combined with output from the Ia afferent of the contracting agonist muscle. If the Ia interneuron does not receive input from the corticospinal tract, reciprocal inhibition may become ineffective. 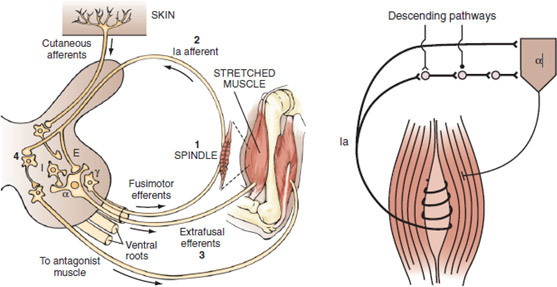 Group II endings (i.e., secondary endings), like Ia endings, are located on intrafusal muscle fibers and are most sensitive to dynamic stretch. Motor axons give off recurrent collaterals that activate Renshaw cells, which in turn inhibit alpha Moto neurons, thereby creating a recurrent inhibitory circuit. Renshaw cells are influenced by supraspinal control, which can facilitate or inhibit them. The gamma system modulates the length of the intrafusal fibers and is therefore responsible for establishing the firing thresholds for group Ia and group II neurons. Lack of inhibition can result in an increased response to stretch and thereby contribute to spasticity.